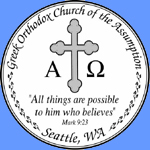 What is the Greek Orthodox Church? • Please join us for a Philoptochos Palm Sunday Fish Luncheon after Liturgy. —It is imperative that you NOT DOUBLE PARK or park in the fire lanes! Please be considerate of others.